Batavia, NY- Calling all employers in Wyoming County! Looking for qualified job candidates? The annual Wyoming County Job Fair is your opportunity to showcase your business and recruit quality employees. On Friday, March 16, 2018 from 10 a.m. to 2 p.m. the Job Fair will take place at the Genesee Community College Warsaw Campus Center and Wyoming County YMCA located at 115 Linwood Avenue, Warsaw, New York. This event draws candidates from all professions, skills and ages. Many are unemployed or under-employed individuals and others are commuters exploring a career change. Attendees will be encouraged to bring resumes and there will be space available to complete applications and conduct interviews on site! Employer registration costs $50 for Wyoming County Chamber members and $75 for non-members. Each participating employer will be provided an 8’ x 10’ space with a table, two chairs and a tablecloth as well as a light lunch during the event. Registered employers will also be included in event advertising. The deadline for employers to register is February 23, 2018, but as advertising is beginning soon, the sooner you register, the sooner your business will be added to the advertising materials. Employers are encouraged to email Kelly Ashcraft at kelly@wycochamber.org to register. The registration form is also available at www.wycochamber.org for convenience. Please make checks payable to the “Wyoming County Chamber of Commerce” and send to 36 Center Street, Suite A, Warsaw, NY 14569. For 50 years, Genesee Community College has been focused on delivering education to support the workforce needs of our communities. As a contributing community member, GCC will be participating in the job fair to share information about educational opportunities, employer training services, and even recruiting for its own career opportunities. 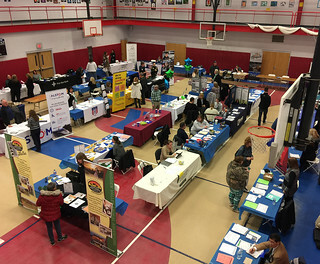 The Wyoming County Job Fair is a collaboration between the Wyoming County Chamber & Tourism office, Community Action for Wyoming County, Genesee Community College, the NYS Department of Labor, Senator Patrick Gallivan and the Wyoming County YMCA. For more information and to register for the job fair, please contact Kelly Ashcraft at the Wyoming County Chamber of Commerce at (585) 786-0307 or by email at kelly@wycochamber.org or Beth Caton at the Community Action for Wyoming County at (585) 237-2600.